The UN-backed International Tribunal on Rwanda is to seek the extradition of a prominent Rwandan genocide suspect arrested in Germany this week. The man, Augustin Ngirabatware, was Rwanda's planning minister in 1994 when an estimated 800,000 people were killed within a few weeks. He is accused of providing weapons for ethnic Hutu militiamen. Mr Ngirabatware was one of 18 people named by the International Tribunal as war criminals who are still at large. According to the Frankfurt general prosecutor's office, the 50-year-old is also a co-founder of the Rwandan radio station (Radio Milles Collines) that repeatedly called for the murder of Tutsis. A spokesman for the International Tribunal on Rwanda, Roland Amoussouga, said "Mr Ngirabatware is accused of conspiracy to commit genocide, complicity in genocide, public incitement to commit genocide and crimes against humanity." 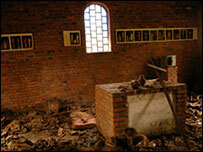 The Tribunal has already convicted 28 senior figures on genocide charges. German police said Mr Ngirabatware had been evading them by regularly changing hotels or apartments.